Our website is packed with features that will help you grow your business. Artists enjoy easy set up and management of your store along with steady traffic to the site offering an opportunity to build your wholesale accounts. Buyers enjoy our second to none emerging artist program offering you and opportunity to shop from up and coming artists and the ease of sourcing thousands of products easily and efficiently. 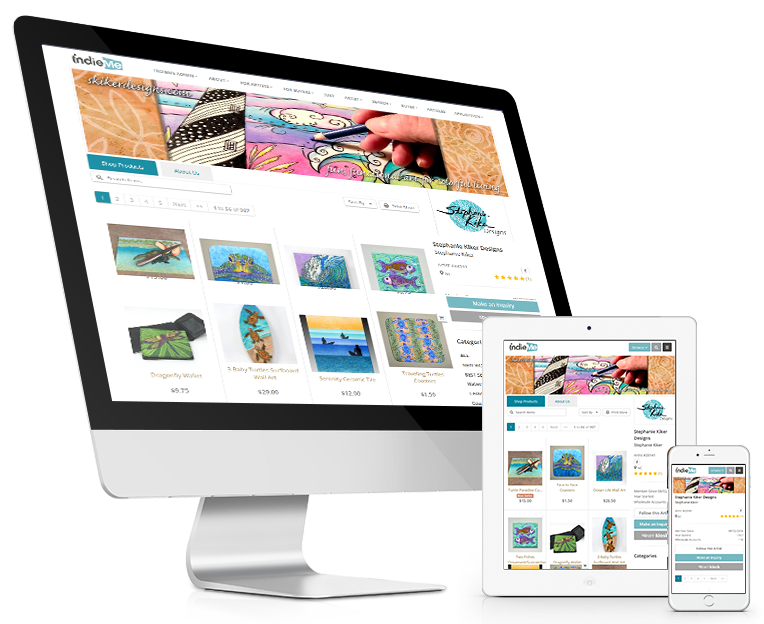 Shop over 50,000 handmade crafts anytime 24/7 with our online marketplace. Discover new products and new artists with the click of a button! View artist consignment terms, drop ship terms and customization terms New! View all your orders in one easy click. See what has shipped, what is open and view status updates quickly! Add multiple ship to addresses New! View all your invoices and print as needed New! Quickly and easily pay open invoices New! At checkout easily pick the shipping method that best suits your needs from the options listed by the artist New! Choose your desired method of payment from the options listed by the artist New! Share and learn among private "Buying Groups". Network with your peers in our exclusive online communities! Upload store images to your buyer profile, including your logo and bio pic New! Create your own Social Profile and link to your personal social media outlets New! Stay up to date with articles centered around content to help you grow your business New! Our low yearly membership fee has payment plans to meet a variety of budgets. Add your branding to your store and make it your own! Add multiple images of you and your studio New! Upload up to 6 pdf's New! Accept orders and securely process credit card payments online. Accept credit cards and e-checks New! 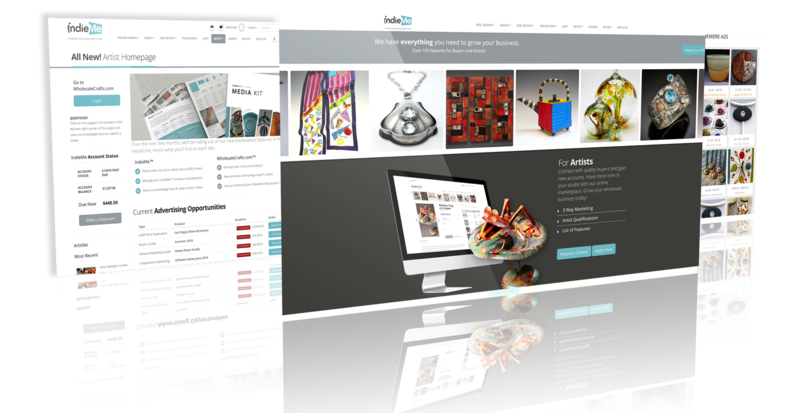 Upload 100's of products with multiple views and arrange using our new drag and drop technology. View real time inventory! Quickly place products on sale New! Upload multiple images to showcase details and lifestyle shots New! Add unlimited multiple product variances to your products New! Tag unlimited related products to any product on your site New! Drag and drop products placing them in your desired sort order New! At a glance see what products are marked new, best seller and on hold New! Provide a full description using our rich text editor, including weight and dimensions New! Share your consignment terms, drop ship terms and customization terms New! Our newly redesigned Customer Record System will help you manage your buyers in one easy place. Review each buyers orders and profiles! View a detailed Customer Record system where you can view all of a buyers orders New! See all emails that have been sent and received between a specific buyer and you New! At a glance view all activity for any chosen buyer New! Manage and assign terms in one easy step New! Quickly update order status and see at a glance what is paid and unpaid. With one click email order summaries, invoices and include a link to get paid! Advanced shipping calculator with many otions - get real time rates New! Quickly update order status and fulfillment details New! Helpful reports providing insight into your success New! Make or add payments using Square, PayPal and more New! Add a discount quickly to a customer's order New! Post tracking information including carrier, date shipped and tracking number New! Our brand new shopping cart will highlight your products in a whole new light. Our products detail page will show multiple images, all your variances and so much more! Thumbnail carousel on the product detail page allows buyer to select items quickly to view in detail New! Add a full description to your products using our rich text editor, add custom terms and more New! Items can be moved to cart, to specific wish lists and from wish lists to cart in one easy step New! Buyers can view related items and quickly place them in the cart New! Enjoy our exclusive online communities and network with peers. Share, learn and grow! Online Communities to network with peers and private groups New! Your online registration to IndieMe™ registers you for both ACRE shows as well. Like what you see and ready to join? Great! Review our artist requirements and select the showcase that best suits your medium. Contact us at any time for additional information.